Because another election day is rolling around, I thought it might be interesting to explore another connection between politics and art. I’m not talking about the signs or “costumes” we see at tea party rallies, nor am I talking about political cartoons or grandiose history painting. You may never have considered it, but politics can influence fashion. The one major example that comes to mind for me is the period around the time of the American and French revolutions, the late eighteenth and early nineteenth centuries. While classical (i.e. ancient Greek and Roman) art was influential on western art and architecture from the time of the Renaissance (c1400-1600) on, it received fresh vigor during the eighteenth century. The discovery of the ancient Roman cities of Pompeii and Herculaneum in 1748, and the subsequent aggressive excavation programs provided new material to inspire artists. Classical art began to have an impact on fashion in the mid- to late 1790s, inspired by the clothing seen on women in ancient Greek vase paintings. Adapting a narrower silhouette for women’s attire and simplified hairstyles (based too on the ancient world) was in part a reaction to the ridiculous extremes of the preceding two decades. That was the period epitomized by Marie Antoinette and the ridiculous side hoops, impossibly corseted diaphragm, and hairdos that were piled up so high they often needed to be on a collapsible wire cage in order to get through doorways. In comparison to the fashions of the 1770s and 1780s, some critics of the new fashion accused women of being scantily clad. Whatever the opinion about the fashion, the rising waistline and simplified hair styles amounted to an emancipation of women from the artifice of the previous period. After the success of the American Revolution (1776-1783) and French Revolution (1789-1799), designers in France (already then considered the fashion capital of the West) consciously borrowed elements from classical antiquity for women’s fashions. Of course the French experiment in democracy ended when Napoleon became emperor (1805), however, French fashions persisted in the neoclassical style. The style was eagerly adapted throughout Western Europe and, especially, in America. Americans viewed their new country as the first true democracy since antiquity, so even classically inspired fashion was seen as appropriate. Because the style flourished during Napoleon’s reign, it is often called the Empire Style. This beautiful, simple, and elegant dress is from Philadelphia, the most influential city in the early American republic. The Empire Style was loosely based on the ancient Greek chiton, essentially a rectangle of material that was pinned or belted at the waist and buttoned at the shoulder. (see the caryatid from the Erechtheum in Athens). 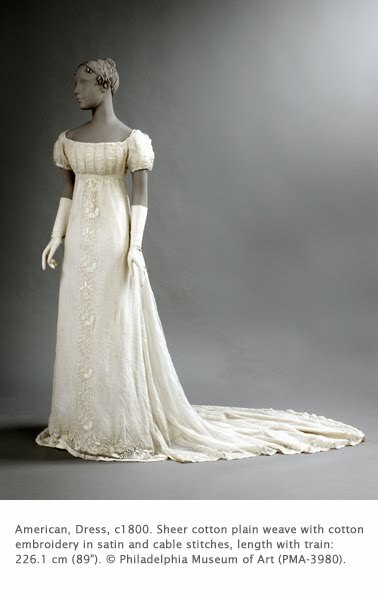 The high waist and narrow silhouette persisted in women’s clothing into the 1820s, although the train disappeared around 1810. Thank you for sharing this interesting insight. I always loved to see the connections and background of artifacts in art history - it adds so much to the surface to know the origin of things. Same for fashion - lovely background information. Keep blogging!